On November 9, the National Bank of Ukraine issued three new coins in their new series entitled “Cultural Monuments in Ukraine,” which will focus on wildlife, fauna, personalities, literature, and legends that have shaped and contributed to Ukrainian culture in their own way. 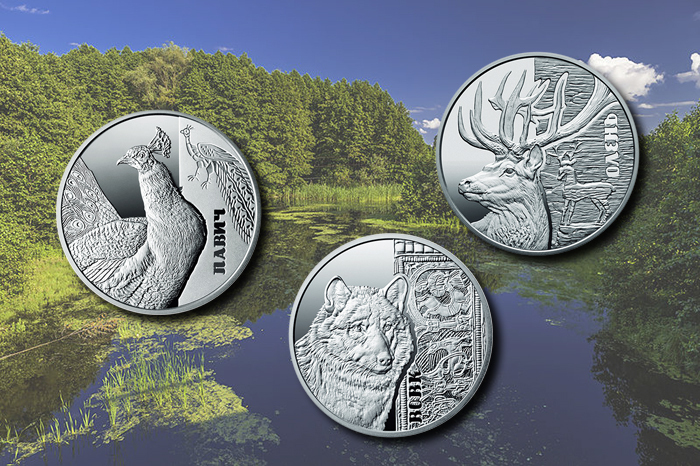 The first three coins feature wildlife as well as the enjoyed national pastime of reading and book collecting, archaeology, and historical landmarks. An illuminated page from Izbornik Svyatoslav 1076, depicting the peacocks and ornamental motifs on which the coin’s design is based. The Peacock: The first coin, dedicated to the peacock, is re-created on the obverse side which honors the millennium-old manuscript entitled Izbornik Svyatoslav 1076. Attributed to an unknown monk, the work contains general moral instructions, aphorisms, and interpretations of the Holy Scripture; some scholars assert that some of the material was compiled in Kyiv. The work is also called the Shcherbatov Izbornik, after the Russian historian M. Shcherbatov, who in the 18th century owned the manuscript, and the Hermitage Izbornik, the imperial public library—now the Saint Petersburg Public Library—where the manuscript was deposited after Shcherbatov’s death. 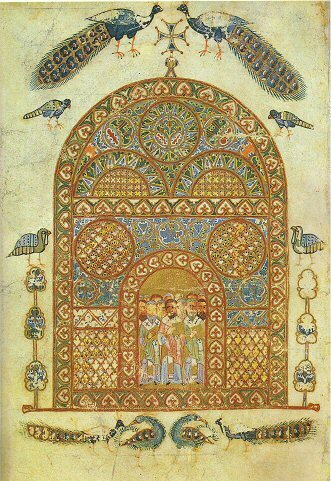 The illustrations contain intricate images of peacocks, and the manuscript is considered one of the more treasured works ever compiled and assembled in what is now Ukraine. The obverse of the silver coin depicts a peacock to the right, its head turned to the left; at upper right is a miniature fragment of the 12-century Gospel of Tartu. Beneath it is the vertical inscription ПАВИЧ (“peacock”). The reverse of the coin includes, at the top, a small State Emblem of Ukraine, the engraved inscription УКРАЇНА (“Ukraine”), and the year of issue, 2016. The denomination is positioned in two lines as 5 ГРИВЕНЬ. In the lower half of the background is a miniature depiction of Izbornik Svyatoslav 1076, overlaid by an image of a gilded peacock as well as a fragment of the obverse miniature. The peacock in the foreground is selectively gold-plated to enhance the artwork.Izbornik Svyatoslav 1076. The Wolf: The second coin in this series is dedicated to this indigenous animal, Canis lupus, who has been portrayed both as a lone creature and as existing in packs, and over the centuries has inspired folklore, legends, and literature dedicated to its independent persona. The largest of the wild members of the dog family Canidae, wolves are powerful, intelligent, social animals. The wolf inhabits both open and timbered areas throughout Ukraine, except very southern regions such as the Crimea. Wolves are common in the forests of north Polisia, in steppe gullies, and in the Carpathian Mountains. Wolves predominantly hunt in pairs or packs and mostly at night. As carnivores, wolves perform the important natural function of controlling the population of herbivores, but they also kill domesticated animals such as livestock on farms. As of 2007, the wolf population in Ukraine exceeded 2,500. The obverse of the silver coin depicts the detailed face of a wolf on the left. To the right is a portion of the settlement bracelet from the Mezin Paleolithic settlement in the Chernigiv region of Ukraine. With stylized images, these fragments were found in the Galician principality and were dated from the 12th to the 13th century AD. In the background at the bottom is the vertical inscription ВОВК (“wolf”). The reverse of the coin includes, at the top, a small State Emblem of Ukraine, the engraved inscription УКРАЇНА (“Ukraine”), and the year of issue, 2016. The denomination is positioned in two lines as 5 ГРИВЕНЬ. To right of center is a depiction of a rhyton (drinking horn) made of an aurochs horn, from the site of the “Black Grave” burial mound (a large, 10th-century burial mound in Chernihiv, Ukraine). The top of the actual rhyton is wrapped with a decorative band of gold, which depicts, among other things, two wolves fighting. That segment of the band is reproduced at the center of the coin and plated in gold. The Deer: The third coin is dedicated to the deer and its embodiment in national culture during several notable periods in the country’s history—in particular, the Scythian era, which made an indelible impression on Ukrainian culture and left behind a rich legacy. The deer is often portrayed as conveying an inherent strength, speed, and wildness, and in Ukraine, the red deer or Cervus elaphus is the prevalent species. At one time red deer were to be encountered throughout Ukraine, but today their habitat is restricted to the Carpathian Mountains and the Crimea, as well as to a number of deliberately maintained breeding grounds. As of 2007, its population in Ukraine was approximately 14,800. Small and nimble roe deer (Capreolus capreolus) inhabit the lightly forested areas in the Carpathians, the Crimean Mountains, and Polisia. In the Askaniia-Nova Biosphere Reserve and Black Sea Biosphere Reserve, as well as in several areas of the forest-steppes, two species of deer have now become acclimatized: the sika deer, or Cervus nippon, and the fallow deer, or Cervus dama dama. The obverse of the coin depicts the head of a deer to the left and a fragment of the Bushansky relief or Rock Temple, which includes a small image of a deer. The Rock Temple itself is believed to be one of the oldest places of worship in Ukraine with one of the bas-reliefs on the wall of rocks dating from the 11th century AD. The relief picture depicts a human praying under a tree, behind which on a small hill stands a deer. On the background of the relief to the right of the coin is the vertical inscription Олень (“deer”). The reverse of the coin includes, at the top, a small State Emblem of Ukraine, the engraved inscription УКРАЇНА (“Ukraine”), and the year of issue, 2016. The denomination is positioned in two lines as 5 ГРИВЕНЬ. In the center of the primary design is a stylized Scythian deer often depicted from remnants of the Scythian burial mounds. This portion of the coin’s design is selectively gold-plated to enhance the artwork. The three coins are produced by the Ukranian Mint in Kiev on behalf of the National Bank and are the work of Ukranian artists Volodymyr Taran, Oleksandr Kharuk, and Sergei Kharuk. The engraving was the work of sculptor Anatoly Demyanenko.